Streptocalyx (strep-toe-cay’lix) – Belonging to the Bromelioideae subfamily; so far only seventeen species have been identified. Usually epiphytic, growing high on trees in hot, humid jungle areas. 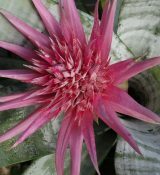 Medium to large plants closely related to the genus Aechmea. One exceptional species, Streptocalyx floribundis, is the giant of the genus with leaves 2.7 m long and an inflorescence, containing a myriad of flowers, 2.7 m in height. They require warm, humid conditions that can only be achieved in a greenhouse.